It’s time for me to break the blog silence, and write again. In my last post, I mentioned it has been hard for me to write when I know others out there are still struggling. We are so grateful to be about six months through our pregnancy with baby “Casper.” We also understand our pregnancy might sting for some people. The hard thing about overcoming infertility is when you know other people are still dealing with that nagging pain and emptiness that used to feel way too familiar to you too. I have a friend who has been going through fertility treatments far longer than we have. She and her husband have experienced more loss and heartbreak than anyone should ever have to endure. They are wonderful people, and Chris and I want them to get pregnant so badly. And here we are moving forward, and watching them go through the process again. It’s unfair. It’s cruel. It’s a reminder of how we should never take what we have for granted. We pray for them, and for all those of you who are still struggling, everyday. Our struggles with infertility have definitely shaped how we’ve approached sharing our pregnancy. For starters, Chris and I have not posted anything at all on social media about being pregnant. I remember how much those posts used to break my heart, and I’d never want to bring that pain on someone else. I’m still not back on Facebook, and have been away from it for almost a year. Every infertility situation is so unique. Midst the joy, anxiety, and gratitude of my pregnancy, every now and then I think about the future. Of course, I find myself regularly wishing that “Casper” was already here, and wanting to speed things up. In those moments I have to remind myself to be thankful for this opportunity, this pregnancy, and this journey. I don’t want our baby to arrive a minute too soon. I want him to grow strong, so when he’s here, we can simply enjoy being the parents of a healthy baby boy. In other moments, I find myself having the realization that this pregnancy is not a cure-all for the challenges we’ve faced. For a long time, during the phases of fertility treatments and ups and downs, I thought of pregnancy as the finish line. After becoming pregnant, I quickly realized infertility had left some pretty thick emotional scars, which resulted in being a fairly anxious mommy-to-be. Even despite meditation, therapy, positive self-talk, and affirmations I found myself being uncontrollably anxious in the beginning. We bought a doppler device so I could listen to our son’s heartbeat in these challenging moments. That little tool helped me so much in the first trimester. Now that I can feel our son moving, I have relaxed a even more. Every milestone helps me to overcome the tormenting fears of the past. Our hearts are overflowing with the gratitude that this pregnancy is going smoothly. We met with a perinatal specialist in weeks 10 and 20 to double check on our sons growth and development. Both times I felt exceedingly anxious in the days right before our appointments. And both times, the doctor told us everything looks “perfect.” What a huge sigh of relief for Chris and me. Every bit of positive information about our son makes me feel more confident and secure in this pregnancy. It has been three weeks since our last update, and quite a bit has happened since then. Things are going well. I’ve had a hard time blogging, however. First of all, I’m scared to give a positive report. I don’t want to jinx anything. I’m normally a sane, logical type, so I’m aware of how absolutely ridiculous this is. However, this isn’t the first time I’ve felt superstitious during the IVF process (and apparently this is common–women in my support group talk about this all the time). Secondly, there are so many people out there who are still struggling and coping with the madness of infertility. I would never want to flaunt my pregnancy, or makes others who are still going through this process feel badly. Thus, it has been hard to want to sit down and write, when on a daily basis I read other’s blogs who are still going through the nightmare of infertility. There’s a strange sense of guilt that comes from overcoming this challenge. Right now, we don’t feel like we fit in anywhere. Moms and pregnant women who conceived naturally don’t really share the same perspective (don’t even get me started on those online groups of women who share your due date. I have nothing in common with these women and find their complaining about pregnancy symptoms to be incredibly irritating). At the same time, we don’t really fit in with the infertile crowd completely either. It’s been weird to give up my monthly Resolve meetings. I miss the support, and the ability to speak to people who totally understand what it feels like to go through this process. I feel like the first trimester of pregnancy after IVF is its own purgatory. We’re so desperate to be on the other side of this struggle. Pregnancy has not solved a lot of the issues I thought it would. I’m still worried that I might never be a Mom. I’m worried something could happen to my baby, and that I’d be forever scarred by loss. This is hard to admit, and harder to write about. I know it isn’t positive, and it isn’t optimistic, but it is something I think about on almost a daily basis. Despite these emotional struggles I’m facing, things have been going well. The bleeding I was experiencing has completely stopped. I’m 10.5 weeks pregnant. 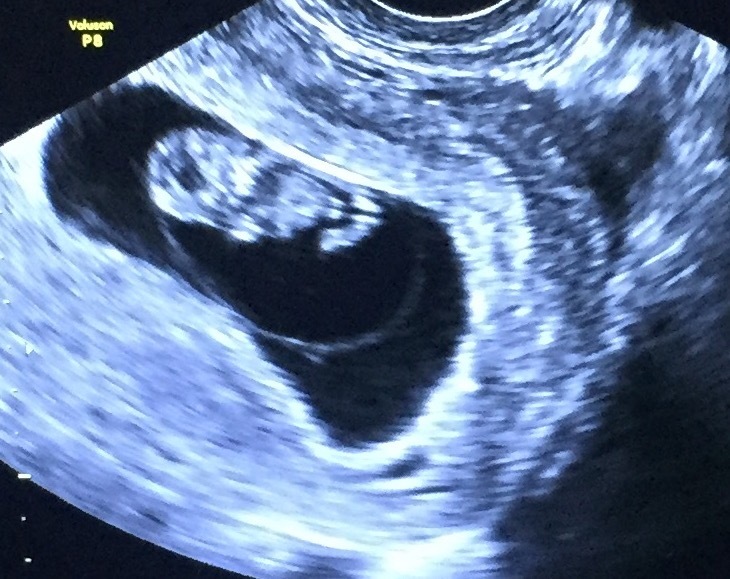 At our last appointment with our RE at 8 weeks, 6 days, we got to see Casper on the ultrasound. He was kicking his little legs and flailing his arms the whole time. It was so cute! His heart rate was strong at 182 beats per minute. That day we graduated from the infertility clinic. At first, this was incredibly exciting. We are so pumped to have that chapter behind us. However, being transferred to the regular OBGYN is a brand new experience. This is the longest wait we’ve had to go between ultrasounds, and it is scary. I bought a Doppler so we could listen to Casper’s heartbeat at home in the meantime, and I wasn’t able to locate it. I think he’s still too small. You can probably imagine, this didn’t calm my fears at all. A week ago, I was taken off all my medication. As much as I’m happy to not have those daily injections anymore, and constant leaking from the suppositories, going off the meds was absolutely terrifying. I worried pretty much all week that perhaps my RE had taken me off the meds too soon. I’m finally starting to really settle in to the idea that I trust my RE, he’s done this thousands of times, and he knows what he’s doing. I might be starting to relax a little bit. I’m sure Chris will be relieved when I can start to feel more at ease in this pregnancy. Poor guy has been on 24/7 reassurance duty, and I’m sure it’s not easy for him either. Our baby boy at 8 weeks 6 days. We spoke with our clinic yesterday, and they informed us that my hCG levels are rising appropriately! Yay!!! On Friday my hCG was at 7,008. That was a huge relief to hear! It means little Casper appears to be growing at a healthy, normal rate. They also said that my progesterone and estrogen levels are within normal range, so I should continue taking my medication as prescribed. The progesterone has made me feel so incredibly backed up. My stomach isn’t the happiest right now. All day I’ve been drinking lots of water and eating high fiber foods in an effort to counteract what’s going on. Hopefully it’ll ease up soon. My morning sickness seems to be coming and going. I read an article today that said morning sickness symptoms include lightheadedness, and exhaustion. I’ve definitely been feeling those. I’ve only thrown up about three times since finding out that we were pregnant, but I feel nauseated at least once a day. It may sound weird, but that’s an incredibly comforting symptom to feel. I actually feel more at ease when I’m nauseous and throwing up than I do when I feel totally fine! We get to see baby Casper via ultrasound on Tuesday. I will only be five weeks and six days at that point, so I’m trying not to get my hopes up that we’ll see much. It’s still really exciting to think that in a couple of days we will be able to see our baby’s growth and progress! Travel with us on the path to our parenthood dreams coming true. When you find yourself where you never imagined, All you can do is stumble into strength. Life as a Moore. Life with infertility. My thoughts and words are my own.